kandeej.com: Yay!!!! I'm in a MAGAZINE!!! I was just looking for a magazine to buy this morning in the Los Angeles International Airport (AKA LAX)...and what do I see but the OCTOBER ( I know! We're still only in the middle of September! )....issue- the BIG ANNIVERSARY ISSUE of ELLE magazine!!!! To think this picture I took with my little old camera made it into the pages of ELLE is so AMAZING to me! Great things can start is weird places like your very own bathroom!!! Yes, it's the big issue with Megan Fox on the front! And here's me with myself on the magazine page!!! Do you think Stranger #2 thought this was weird!? ha ha ha...she did say "congrats" afterwards! The ironic thing is, I have the same make-up look on in real life as I had on in the picture....pin-up lips and red mouth! ha ha ha weirdy! love from the airport and ELLE magazine!!!!!!! I'm so excited!!!!! Yay! That's So exciting congratz!! lol @ missing your flight! how did you get into the magazine? did they just pluck you out from all your work and award it to you without your knowledge/entry? awesome and you look stunning! hey! You're kinda famous :p Congrats anyhoo! Yeah! First comment. Congrats Kandee. This couldn't have happened to a sweeter person! I'm sorry about your missed flight though. I hope all goes well getting home. Love ya! You'll be on the cover one day! Super exciting and you deserve it...enjoy every moment! That's great Kandee! Congratulations and keep up the great work and keeping it real. 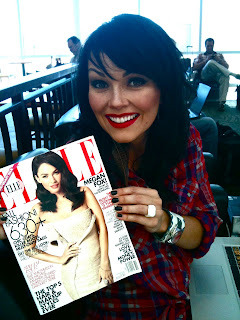 Awesome Kandee...I will definitely buy that issue!!! Hope you/ cupcake and the rest are doing well!! Congrats thats so freakin' awesome!! I think that's absolutely wonderful!! Sorry you missed your flight, but a BIG congrats on the magazine!! Safe travels!! HUGS! Kandee you look so lovely! Congratulations on that.....how nice to see yourself in a magazine!! Congrats Kandee!! love ya and your little cupcake! Congrats, Kandee! You deserve it! OMG!! That's so freakin awesome!!! I'll be heading to the nearest grocery store to get my own copy to read it! Congrats Kandee. You look gorgeous. Woow!!!! that is so cool!!!! I am so proud of you, Kandee!! and you know what? you look awsome on that picture, yeah the one you took, yourself!! in your own bathroom!!! that is so cool! Wow, that's such inspiring! I can't figure out how exciting seems to be see yourself in a magazine! I am on my way out to buy this mag! My two faves, Megan Fox and Kandee Johnson!!!! 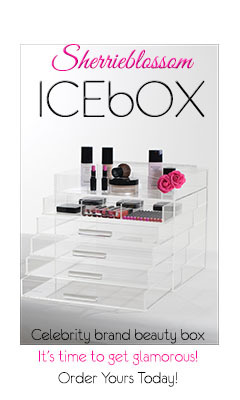 I really hope this gets you tons of makeup jobs!! You are AWSOME!!!!!!! I was sad that last time you were in this mag I missed it, not this time though!! i think it's safe to say that everyone of us (your loyal followers) is soooooo proud of you!!!! awesome kandee !! so excited for you!! Yay! Our Make-up mom is getting the attention she DESERVES! We love you sooo much! Can you type the text which is next to your pic, or take a pic, from the whole page, so we can read the article as well?? Thank you and take care!! 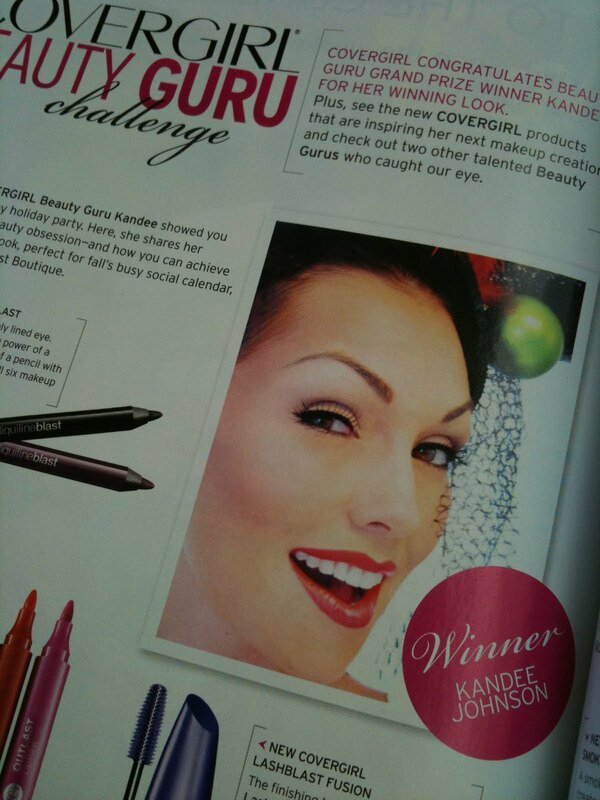 wow congrats kandee!!!! :) your so pretty!!! Thats a very pretty look!! Congrats, Kandee! Your blog always makes my day brighter. <3 you! Kandee I always thought you photograph beautifully! Can you please do a video on some good poses you have seen working with beauty models? How exciting! Thats really great! YAY!! Congrats Kandee! That is awesome! YOu can be so proud! I luv you Kandee, congratulations! congrats! You look so pretty in the magazine! I'll love for you to check it out! Yay!!! That is SUPER FANTASTIC!!! Im really happy for you. I'm definitely gonna go buy a copy of the magazine!! Congrats!! Kandee, your beautiful face is just the outer shell of a marvelous artist/writer/teacher/encourager. Plus, you're a very smart person to put all of this together for a career. Wow! Photo shoot in your bathroom! That blows me away! Congrats and all my admiration. What an incredible accomplishment! I love how we live in a time where we can take simple things (like bathroom photos) and let them bring us the extraordinary harvest. Kudos to you, Kandee! I just discovered you a few days ago after my friend Aundi went to your Atlanta Glaminar. I have to tell you that one: you are gorgeous! 2-you are so sweet and precious! I can see the love of Jesus in your eyes! Three: I love the make-up videos, I've already tried a couple things and LOVE them! 4-Thank you for your openness and honesty about your pregnancy and life, it is so encouraging to see someone take responsibility for their actions, encourage people while doing it and to explain the grace of God that covers all things. I pray blessings on you and your adorable babies and the little one on the way! PS would you do a video for blue eyes? Congrats! omg that sounds amazing! Thats so cool! how did you get in the mag? Are they acknowledging your make -up work?? Good for you Kandee :D I'm so happy for you!!! Im so Happy and excited our favourite make up guru, our idol, the inspiration for all of us is getting the attention she deserves! u desrve a whole lot more for beeing such an amazing fun-loving, hard-working, caring, inspiring person! the pic looks gorgeous for a sec i though elle called u to take a photoshoot with you, it looks that proffesional! Would you mind if u take a photo of the actual text or type it to us becouse for us who live in contries where we cant buy Elle, we have no chanse to read it. COngrats again, keep up sharing the love, we all love you! MWAH!